Looks even faster with this guy! So, essentially a modest progression from last year's livery (from my first viewing of it). I like it though. Looks like the car is smiling, just needs a toothy grin on the front wing!! Danny looks pleased with it. Danny is the last piece of the puzzle. Hulkenberg et. al. are good drivers, but they are not proven winners. Daniel has proven he can win in a competitive car; that he can qualify at the front. If Renault does not do well, then it is probably the car and not the drivers who are at fault. This is actually good for the Hulk, if he can be competitive with Danny, his stock should rise. It will be interesting to watch. This is actually good for the Hulk, if he can be competitive with Danny, his stock should rise. It will be interesting to watch. That's what I'm hoping for too!! 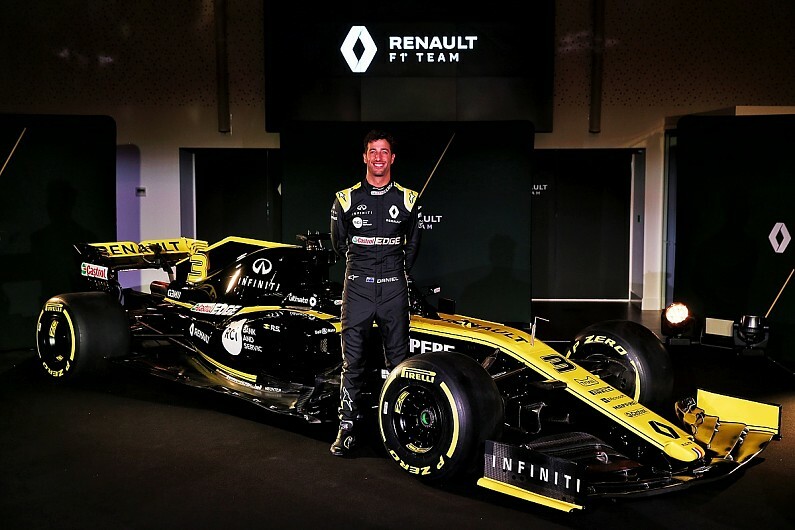 I'll love to see Renault move forward, with Danny Ric & Hulk squeezing every 10th out of the car and themselves. This will be the battle I'm keen to follow in 2019. Sorry guys, I have to get a "good moan" off my chest again!!! For the obvious reason, that these photos (or slideshow if you will) comes direct from Formula1.com ... I'd say the quality is a bit naff, considering the source. That's the problem of releasing renders of a new car. Or a benefit for the team perhaps as you can control the quality of what you release. I doubt the car we see in testing will look a great deal like the renders that have been released. I like this 'launch week' thing we have, but it is largely redundant as hardly anyone actually shows their real car! It's great, isn't it? I really am a fan. So far, the HAAS and Renault "paint jobs" look well balanced and stylish. Let's see what tomorrow brings, as it's going to be a busy one for my paint bucket (between work related web commitments of course). So, Merc, RBR and Stroll in the Park (sorry, Racing Point) to come in the morning!! Working in the morning so will miss some of the launches. How dare work get in the way of F1 launch season Looking forward to seeing them though. We will provide you with a summary and a photo albums of angles to get you through. From here on in, I am keen to now see the Alfa Romeo, but I hope the NB logo doesn't spoil what could potentially be a very nice looking car!?! ?